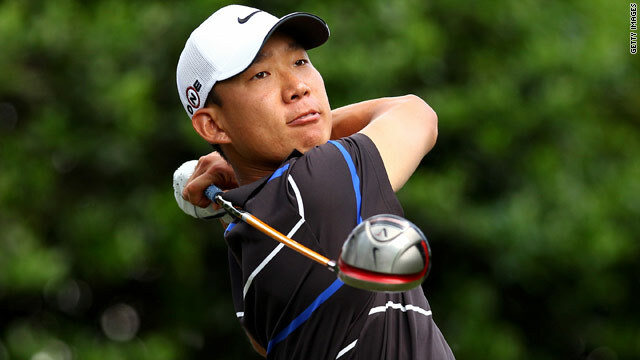 Anthony Kim has described his part in the 2008 U.S. Ryder Cup win in 2008 as one of the greatest moments in his career. (CNN) -- American golfer Anthony Kim hopes to be fit for the prestigious Ryder Cup teams event in October after deciding to have a thumb operation that will rule him out for up to three months. Kim, who is second on the U.S. Ryder Cup points list behind Phil Mickelson, pulled out of this week's Players Championship at Sawgrass due to shoulder complications caused by the problem. The world No. 11, who helped the United States beat Europe in 2008 to reclaim the trophy, had an operation in Maryland, Baltimore on Wednesday. "While I had hoped to be able to continue to play through the injury, compensating for it was starting to cause other issues, including a sore shoulder. We had to get it fixed," the 24-year-old said in a statement. Kim claimed his first PGA Tour title in two years when he won the Houston Open last month despite being troubled by the torn thumb ligament, and then finished third at the Masters. However, he will now miss the second major tournament of the golf season, the U.S. Open in June, and possibly also the third -- the British Open in July. But he should have plenty of time to get fit for the Ryder Cup, which was first staged in 1927, at the Celtic Manor club in Wales on October 1-3. Kim tied for seventh at the Quail Hollow Championship last weekend, where he revealed how much he wanted to be ready to take on the Europeans again. "I want to play in the Ryder Cup, and that's a huge goal of mine," he told reporters. "It was probably one of the greatest moments I've had playing golf, or greatest weeks I've had playing golf, playing for the U.S., dreaming about being on that team. So I want to be healthy for that. I just want to time it right." Kim's surgeon, Dr. Thomas Graham, said he was pleased with how the operation went. "Anthony sustained a high-grade partial tear of the ulnar collateral ligament of his left thumb several months ago, and over the course of the last several months of tournament play, the status of the ligament proved insufficient for Anthony to compete on Tour," the chief of the National Hand Center in Baltimore said. "I was extremely pleased with how the repair of the ligament went and would anticipate that Anthony will be able to return to play in 10-12 weeks."